The information presented on this page was originally released on June 2, 2011. It may not be outdated, but please search our site for more current information. If you plan to quote or reference this information in a publication, please check with the Extension specialist or author before proceeding. 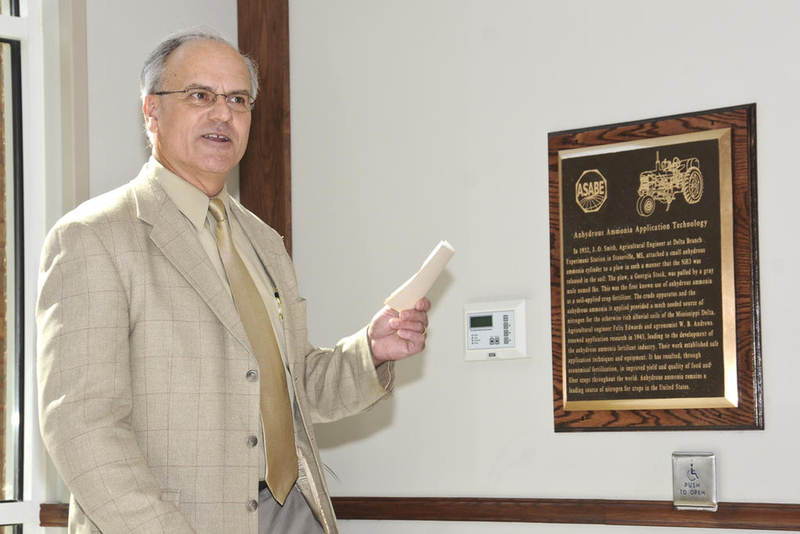 The plaques honor the achievements of MSU faculty members J.O. Smith, Felix Edwards and W.B. Andrews, all deceased. The three were instrumental in the development of anhydrous ammonia application technology, which gave birth to Mississippi Chemical Corp. The plaques are the 56th markers placed around the country by the engineering society. Other markers commemorate milestones and inventions, such as the McCormick reaper, the John Deere plow, the New Holland hay baler and Eli Whitney’s cotton gin. Mississippi hosts another marker for agricultural aviation in Jackson. Herb Willcutt, recently retired agricultural engineer with MSU’s Extension Service, said MSU faculty members began the long and detailed recognition application process three years ago. The plaques commemorate the work begun in 1932 when Smith, an agricultural engineer at the Delta Branch Experiment Station in Stoneville, initiated the research. He attached a small anhydrous ammonia cylinder to a mule-drawn plow to release the material into the soil. This was the first known use of anhydrous ammonia as a soil-applied crop fertilizer. The crude apparatus and the anhydrous ammonia it applied provided a much-needed source of nitrogen for the otherwise rich alluvial soils of the Mississippi Delta. In 1943, Edwards, an agricultural engineer, and Andrews, an agronomist, renewed application research. Their efforts led to the development of the anhydrous ammonia fertilizer industry, which peaked in the 1960s and continues today. At http://www.asabe.org/awards/, find a list of historic sites designated by the American Society of Agricultural and Biological Engineers.